the 120 coolest rental bikes in portland! We have FULL SUSPENSION MOUNTAIN BIKES & CARBON ROAD BIKES! "Super friendly staff, lots of quality bikes, and super affordable! I would absolutely come back and rent again!" Upright & comfy with fenders and thumb-shifters. Lots of neat custom-built bikes to explore the entire city on a budget. Fits 4'10"- 6'6" (25lbs lighter than Nike bikes). Do more & get there quicker! Portland like a pro! 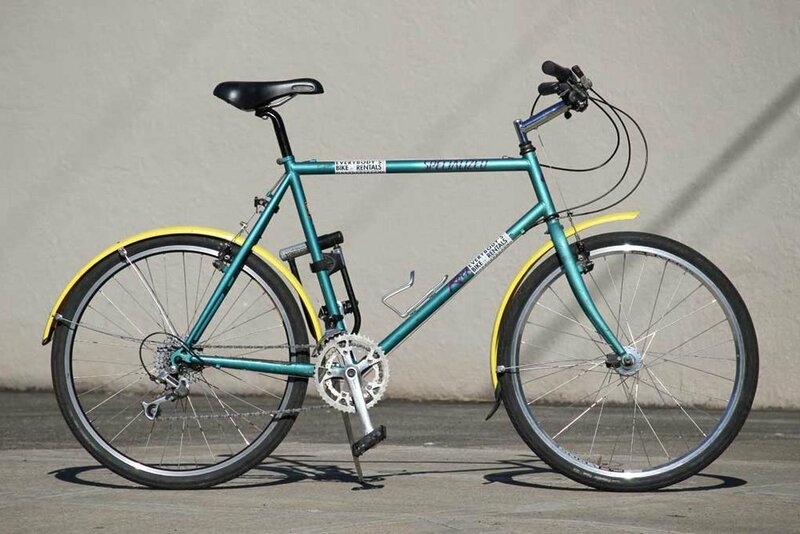 Nice vintage lugged-steel or alloy road frame with road wheels and flat bars (hybrid-style build, but faster). (35lbs lighter than Nike bikes)! ALL PRICES INCLUDE LIGHTS, Kryptonite U-LOCK, BELL HELMET, BIKE MAP, INSIDER TIPS, RAIN GEAR & UNLIMITED MILES. Click HERE for a complete list of our Elite Bikes! Fastest & lightest, Mostly 10 speed Ultegra and Dura Ace on sweet carbon or high end Al/Carbon bikes with fly wheelsets. 17-19lbs. Sizes 45cm-60cm. Fast & light, aluminum/carbon or high-end steel. Get your miles in on a racing bike! Mostly Shimano 105 or Tiagra integrated shifters and components. Sizes 48cm - 61cm. (35-40lbs lighter than Nike bikes). Conquer the trails with a tubeless full suspension shred-machine! We’ll tell you where to find the best trails in the area so you can see what PNW MTBing is all about! All bikes have a dropper post. Sizes S, M, L, & XL available. Reservations must be made at least 48hrs in advance. Intermediate-advanced riders only (sorry newbs). Check out our suggested MTB rides! Explore Portland’s scenic trails on a bikepackable 27.5+ tubeless hardtail! We’ll tell you where to find the best trails in the area so you can see what PNW MTBing is all about! Great for beginners and bikepackers alike. We have frame, seat, and handlebar bags! Sizes S, M, L available. Sturdy for the long haul with lugged steel frames, bar-end shifters, rear racks, & wide range gears for the hills! Yes, you can ride them to Astoria or San Francisco or New York (as long as you ship them back!) 49cm-64cm. ALSO see our hard tail mountain bikes which can be used for bikepacking. We have frame, seat, and handlebar bags! Kid's bike - 24" wheels. These are best for kids 4 to 5 feet tall that are comfortable riding on their own and using gears and hand brakes. *Note: we rent kids bikes along with adult rentals only. Burley D'Lite Trailer for one or two children. Your child should be able to sit up and wear a helmet to ride in trailer. *Note: we rent kids trailers along with adult rentals only. Trail-A-Bike. Good for kids that want to pedal along, but are not yet tall enough to comfortably fit our 24" kids bike. *Note: we rent trail-a-bikes along with adult rentals only. Saris Bones 3 or Hollywood 3 trunk rack $10/day. *Note: we rent trunk racks along with adult rentals only. Panniers are available for $5/day or $25/week. *Note: we rent panniers along with adult rentals only. Waterproof Rain Pants - Free! with rental upon request. CREDIT/DEBIT CARD PRICES ARE 3% MORE for all items.